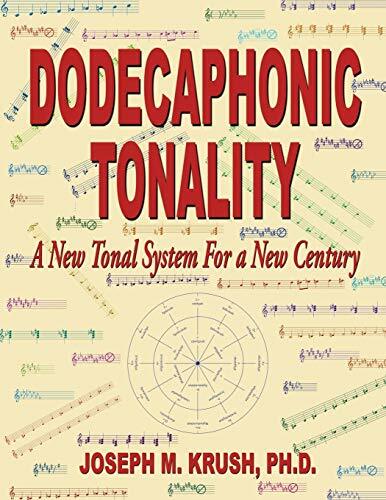 Twelve-Tone Tonality: Expanded Diatonicism - Dr. Joseph Krush presents new Dodecaphonic Tonal sets and leads readers through Expanded Diatonicism, Nonaphonic and Decaphonic Bi-modality, culminating with "The World's Best Dodecaphonic Tonal Set." He illustrates Semi-Modulation through Rotating Quintcircles. Relative Compatibility of Keys and Chromatic Clashes of Tones are also explored. Composers will benefit from this groundbreaking new system. Krush addresses the question: "What kind of a tonal system would result if the major and minor modes were combined into one, fused major/minor key?" His ultimate answer is: "Uni-tonal Nonaphonic Bi-Modality." Covering topics including Nonaphonic, Tri-Tonal, Bi-Modal Systems, Hendecaphonic and Dodecaphonic Systems, and Dodecaphonic Tonality and Functionality, the book is divided into two parts and spans 25 chapters.